Wearing a fitness tracker doesn't mean having to advertise the fact you're watching your health, nor wear some nasty plastic on your wrist. There's a host of brilliant clip-on fitness trackers out there, which you can hide on waistbands and bras and still get heaps of decent data about your lifestyle. And it's not just step trackers. There's a world of discreet wearables, trackers and running devices being woven (literally sometimes) into our clothes. If you're looking to be a better runner, really ramp up your training or get a head of the curve with innovative smart jewellery, we've rounded up the best. If you don't want to wear it on the wrist, you can always move the tracking to somewhere where it's plain out of sight. There's a bunch of fitness trackers that offer the wearing alternative of clipping the wearable to the waistband of your trousers or jeans or even attach it to a bra or t-shirt that you're not planning to have on show during the day. One of our favourite fitness trackers, the Misfit Shine 2 doesn't exactly produce the most detailed biometric analysis of your health, but is a solid and reliable step and sleep tracker, that can be clipped anywhere on your body. To improve accuracy, you can specify the location within the app and it works. The Misfit Shine 2 has always been a beacon of accuracy in our testing, and comes recommended to those who don't want to wear their tracker around their wrist. A real surprise package, the Bellabeat Leaf Urban has been a hit, thanks to its distinct design and aptitude as a clip-on device. The data is a little basic, with just steps and sleep tracked – but there are some unique features. The app features, menstrual cycle, fertility tracking and meditation. It's all a little manual, but it puts a lot of your data in one place – more so than the likes of Fitbit and Misfit. The Fitbit Zip is the company's most basic tracker, but still does a pretty fine job of collecting your data. The Fitbit Zip tracks steps and estimates calories burned from activity, and can be clipped to trousers, belt or bra out of sight. All this data feeds into the Fitbit app, so you get the same experience as people with swanky, flashy wrist trackers, with a battery life of six months. An interesting little tracker, the Nokia Go uses an e-paper screen to keep tabs on your daily progress. Aside from step and sleep tracking there's some basic automatic detection of workouts, although the data you can glean is pretty basic. Sleep data we found to be a little wonky during testing, but if you're looking for a discreet tracker with a quick visual display of your goal progress, the Nokia Go ticks most boxes. One option for female fitness trackers (sorry chaps) is to ditch the Fitbit for a piece of smart jewellery that actually looks like jewellery but can offer similar fitness tracking powers to an Alta HR or Charge 2. Ringly comes as an 18k gold plated ring set with a choice high-class finishes. It buzzes for notifications so you won't miss calls when your phone is out of reach or in a bag, and you can ensure you're only notified of selected callers if you don't want to be disturbed. As well as activity you can track sleep and get smartphone alerts as buzzes on your jewellery clad wrist. The stainless steel Thompson bracelet is available in rose gold tone and silver tone and has pavé accents around the module and on the bracelet itself. 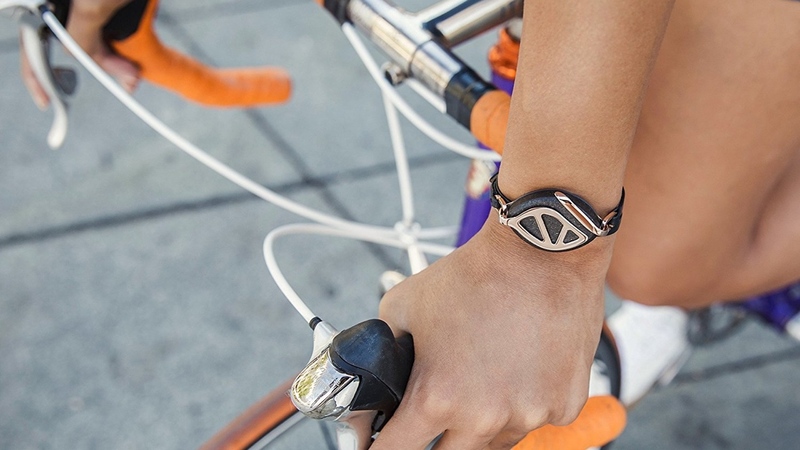 This unisex smart ring, Motiv, promises fitness tracking from the finger. It features an optical heart rate sensor and measures steps, distance, calories as well as sleep. A pretty complete set of features from such a small device. Kate Spade's line of designer, activity tracking 'n' alerts wearables includes this Bangle Tracker, which tracks basic steps and sleep – with fitness tech borne out of the Misfit acquisition, so you know it's good. If you're not busting out the shorts everyday, then you can always consider taking your fitness tracker to a place where it's best placed to deliver accurate step counting and that's down by the feet. There's not many options out there that offers basic fitness tracking, but the Moov Now, one of our sporty wearable faves can make this a reality right now. Another favourite at Wareable is the $29 Milestone Pod, which offers runners feedback on technique from a unit on the shoe. The nice thing is that the Milestone doesn't require you to take your phone out for the run, which means you can catch up with metrics like foot strike position, cadence, and efficiency when you get back. Smart shoes or trainers are logical place for fitness tracking that remains unseen. Right now the options are limited. While there's connected footwear from the likes of Under Armour or startups like Boltt and Iofit, they are all focused on tracking during workout time. Fujitsu's cloud-connected smart shoes promise to be the answer for fitness tracking lovers, but sadly these smart kicks are still only a concept. For now, the Moov Now is your best option, but it's one we rate pretty highly, so it's not a bad option until there's more wearables to choose from. If you really want to keep that tracking invisible, then smart clothing is the best fit. Much like smart shoes, there's not a whole host of options out there just yet that are dedicated solely to 24/7 activity tracking because are most built for tracking workouts in real-time. Hexoskin's Smart shirt does promise to track steps as well as sleep, measuring resting heart rate, breathing and sleep position. The washable smart garment still requires a clip on sensor to provide the smarts and its compressed design means it's not going to be the most flattering fit for the average person. More fitness tracking smart garments are on the way though. The AIO Smart compression sleeve offers step, distance and sleep tracking for instance. Vitali, a smart bra that's main aim is to fight stress using heart rate variability is scheduled to launch next year. It also has plans to add activity tracking into the mix in the future. Don't be surprised if we see more smart apparel geared towards daily activity tracking in the not too distant future.